Synopsis: Something big is brewing in Trenton, N.J., and it could blow at any minute. Stephanie Plum might not be the world’s greatest bounty hunter, but she knows when she’s being played. Ken Globovic (aka Gobbles), hailed as the Supreme Exalted Zookeeper of the animal house known as Zeta fraternity, has been arrested for beating up the dean of students at Kiltman College. Gobbles has missed his court date and gone into hiding. People have seen him on campus, but no one will talk. Things just aren’t adding up, and Stephanie can’t shake the feeling that something funny is going on at the college – and it’s not just Zeta fraternity pranks. 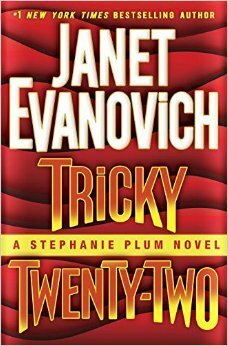 Review: Stephanie Plum is a long series by Janet Evanovichet and here comes the 22sd Volume, okay more are out now but I took my time to read this one. Besides, for a change, I tried this novel in audio. This is the second time I try a similar format and I admit that the experience was better than the first time. My concern is always the time and my inability to stay focused long enough to really follow everything but I think the audio in French might be a bit simpler for that. In all cases we find Stephanie in a whole new story where Morelli explains at the beginning that he would like take a break with her (yes another one) and he wants to reconsider his life to know what to do exactly. I’m not telling you in what state this revelation puts Stephanie. But then, it does not change the fact that our heroine has to work. First, she has to work to Ranger as a bodyguard to keep a woman safe, but she must also find a fugitive that everyone seems to hide. Finally, you can imagine that like always we have crazy situations, exploding cars and a heroine we love to follow. I spent a good time with this new novel as always. I think the series is perfect when you want a light and pleasant moment. It is true that the story does not vary much but it is not really a problem and we have a nice surprise at the end of the novel! Well I hope she finally picks the man she wants. I quit reading at probably 17 or 18 because each book became repetitious and I just couldn’t anymore. I loved this series for a very long time. One of these days I will start this series. I’m glad your second chance at audio worked better. I’ve read books from the author’s other series and they are fun and light. Wow. This is a pretty long series. Sorry to hear this installment wasn’t better. It seems like the author may be running out of material. I would be really annoyed if the relationship kept going back and forth. I hope the next book is better for you. This is a series I’ve been endeavouring to read, but I haven’t been able to find the first book in my thrift store. Lol. I’m glad you’re enjoying these books! I haven’t read this series but this book does sound good. I don’t know if I have read this one or not. I have read a lot of the books in the series several times but I haven’t picked any of them up recently. I have the first few books in audio but have only listened to one so far. Glad you enjoyed this one overall. I have heard good things about this author. Never got around to reading anything of hers though. The series is long though. I’ve been wanting to try this series but always forget about it, thank you for the reminder! Wow, these books are up to 22 now. Hard to believe. It’s good you’re still having fun. Il faut vraiment que je découvre cette auteur ! I keep saying that I’m going to try this series. I love the narrator (Lorelei King in the US, don’t know if she is the narrator outside of the US or not). Glad to see you enjoyed this one.